The Pictish period skeletal remains, c . 430 – 630 AD, of a robust young man with severe cranial and facial injuries was found by archaeologists in a cave on the Black Isle in 2016. As has been widely reported, a facial reconstruction of the man was later produced by Dame Sue Black and her team at the University of Dundee. This is an account of the story from a digger’s perspective. 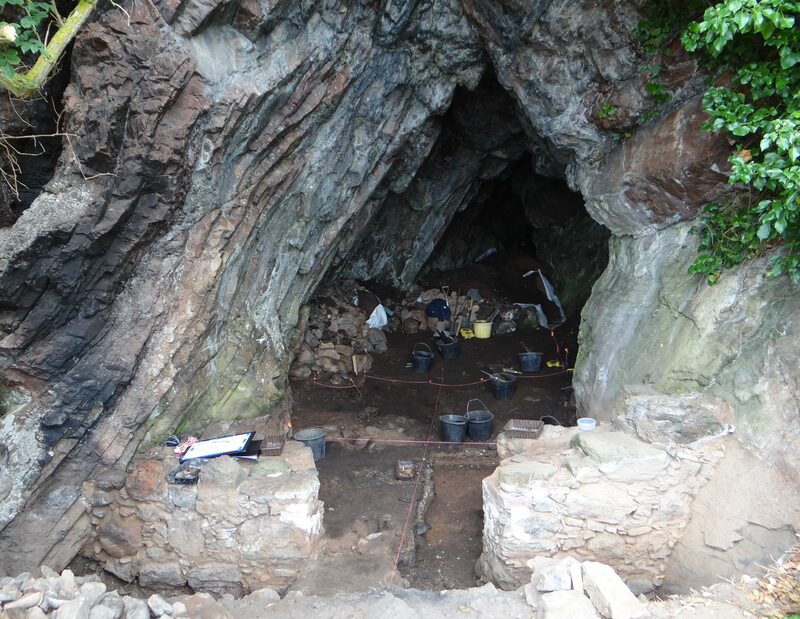 The Rosemarkie Caves Project (RCP), founded and led by Simon Gunn as a part of NOSAS, has since 2006 investigated the archaeological potential of a range of 19 caves on a 2.5 mile stretch of coast north of Rosemarkie. Activities have included comprehensive surveys, test pitting and fuller excavations (see our earlier blog post for an introduction). In September 2016 it was decided that a full two week excavation would be carried out at “Cave 2B” where previous test pitting results had been revealing some interesting results. Here animal bone and charcoal excavated from depth of over one metre had yielded calibrated radio carbon dates of 600 – 770 AD, which is generally regarded as the Pictish period in Scotland. In addition this particular cave also had an unusual built wall structure spanning its entrance. It was felt by the RCP Committee that these factors made it a prime site for more detailed excavation. View of the cave towards of end of the 2016 excavation. The excavation area had now been divided into quadrants. Note the substantial wall in the entrance. The Rosemarkie Caves Project was extremely fortunate to have experienced professional archaeologist Steve Birch volunteer to direct the excavation full time. In addition Mary Peteranna was also in attendance on a number of days when her duties as Operations Manager at AOC Archaeology would allow. I had signed up as a volunteer for almost the full term along with the rest of a small but enthusiastic team. This entry was posted in Black Isle, Excavations, Pictish and tagged 1400 year old murder victim, 3d modelling, Adrian Maldonado, ancient DNA, archaeology 3d Model, archaeology highlands, Black Isle archaeology, bodies held down with stones, bog bodies, bowl furnace, cave archaeology Scotland, cave burial, cave skeleton, Centre for Anatomy and Human Identification, charcoal store, cobbled surface in cave, Dame Sue Black, defensive injuries, deviant burials, early medieval cave burials, excavating human remains, facial reconstruction, highland archaeology, interpersonal conflict, iron slag, isotope analysis, kiln lining, Learnie caves, low light photogrammetry, Mary Peteranna, medieval cave wall, murder or sacrifice?, North of Scotland Archaeological Society, photogrammetry, Pictish, Pictish burials, Pictish human remains, Pictish metal working, pictish skeleton, picts, Picts Rosemarkie, Portmahomack Martin Carver, radiocarbon dates, ritual burial, Rosemarkie, Rosemarkie archaeology, Rosemarkie caves, Rosemarkie Caves Project, rosemarkie man, Rosemarkie Man NOSAS, Shirley Curtis-Summers, Simon Gunn, Smelter's Cave, Steve Birch, tuyere, University of Dundee, wall in cave entrance on February 19, 2017 by nosas. 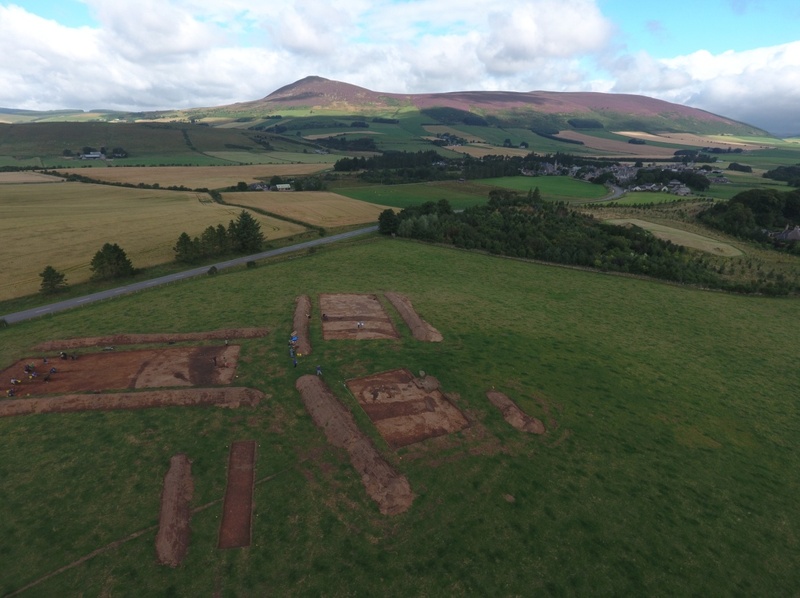 A fourth season of excavation took place at the Craw Stane, Rhynie over August – September 2016. The project was led by REAP Project Directors Dr Gordon Noble, University of Aberdeen and Dr Meggen Gondek, University of Chester. 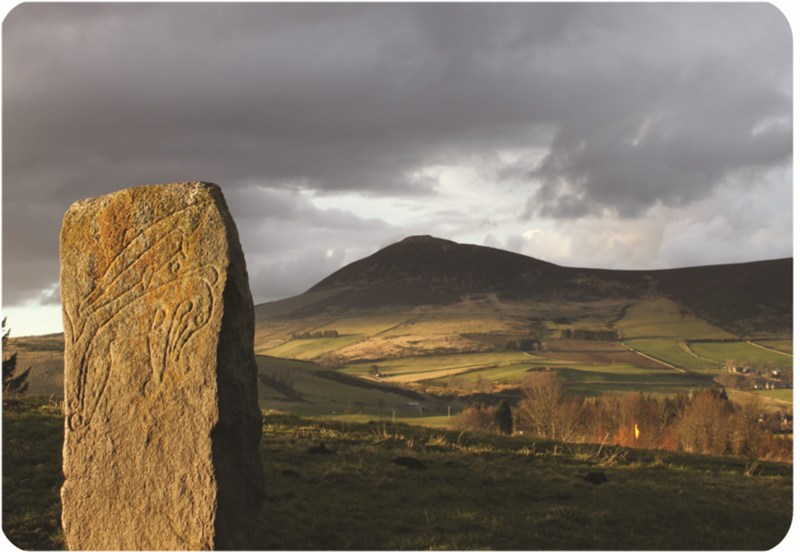 Aerial photographs and geophysical surveys had identified curvilinear enclosures around the Craw Stane, one of the few symbol stones remaining in situ in Scotland (Plate 1). Previous seasons of work at the Craw Stane (one of seven Class I Pictish symbol stones from the area) in 2011, 2012 and 2015 had demonstrated that these enclosures took the form of an inner and outer ditch and a later palisade structure with associated postholes. Excavations in past seasons had revealed a number of high status objects including fragments of Late Roman Amphora, glass beads, metal pins, glass vessel fragments and evidence of metal working in the form of metal working tongs, slag (metal working waste) and clay moulds for metal objects. The features date the site to the early medieval period and radiocarbon dates from the ditches and other internal features confirmed a relatively short 5th-6th C construction, occupation and abandonment of the site. 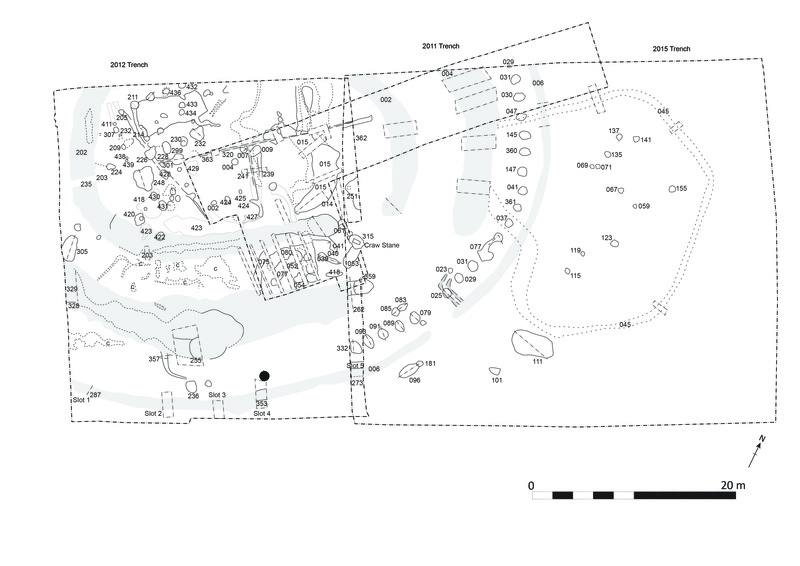 Plate 2: Rough draft of the excavations from 2011, 2012 and 2015. A work in progress! The 2016 excavations aimed to investigate areas of the site that hadn’t been looked at before, continuing to use the successful strip and map approach employed in previous years. This involved 4 large areas or trenches (Plate 3) where the topsoil was removed by machine and watched by archaeologists. The areas were then cleaned by hand by a team of archaeologists, students and volunteers, using hoes, krafses and eventually trowels. This made archaeological features more visible and easier to record. Plans of the site were created using DGPS (accurate to the nearest cm) and aerial photography using a drone. Areas with more complexity were drawn by hand. This entry was posted in Aberdeenshire, Excavations, Pictish and tagged Aberdeenshire archaeology, aerial photography, Archaeological dig, Cathy MacIver, clay mould, craw stane, crucible fragments, crucible mould, crucible stand, DGPS, Dr Alice Watterson, glass beads, Gordon Noble, Meggen Gondek, metal working tongs, Northern Picts, palisade, Pictish, Pictish metal working, pictish symbol stone, pin moulds, post hole, post pipes, radiocarbon dates, rhynie, Rhynie 2016, Rhynie GIS Plan, rhynie woman, Roman amphora, Scottish archaeology, Tap o' Noth on December 4, 2016 by nosas. The blog has now been established for 4 years. We currently have more than 70 blog posts and over 80,000 total views! We are always on the lookout for exciting new material. NOSAS members and individuals from the wider archaeological community are welcome to submit posts. These should be archaeologically based, preferably relevant to the highlands/ north of Scotland area and submitted by the author. If you have an idea please send us an email.